This was my second time visiting Bangkok, Thailand. I had chose this hotel because it was affordable and good location to the shopping paradise. 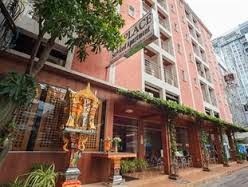 If you first time visiting Bangkok, maybe this hotel slightly hard to find. It's because it located at the alley. The staffs were friendly and greeted us. We checked-in the our room within 5 mins. We had booked standard twin. Good - 1. The room is spacious and neat. 3. The bed was hard and uncomfortable. The location is convenient and is accessible to the Airport Link Ratchaparop station. A walking distance to Patrunam market, Baiyoke Sky, Platinum and many more. 20 mins walk to the Siam.